Jens-Hinrich Binder is Professor of Law at Eberhard-Karls-Universitaet Tuebingen (since April 2013), where he holds a Chair in Private Law, Commercial and Corporate Law. Following his clerkship with the High Court of Freiburg, the State Prosecutor’s Office of Freiburg, the Administrative Court of Freiburg, and law firms Freshfields Bruckhaus Deringer in Frankfurt and Lange Brunner in Freiburg, he qualified as a practitioner under German Law (Zweites Staatsexamen). 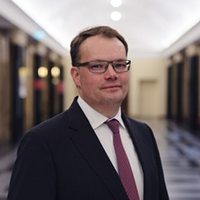 He has held visiting professorships at the Universities of Munich and Mainz, before he was appointed to a Chair in Private Law, Corporate, Banking and Securities Law at EBS Law School in Wiesbaden (held until March 2013). He has published two treatises on bank insolvency law and the regulation of corporations, respectively, as well as numerous articles in both German and international law reviews. Both treatises have received awards for outstanding research from the University of Freiburg. Jens-Hinrich Binder has been co-organiser of an international symposium on bank restructuring and the new EU Directive on the Resolution and Reorganisation of Banks in Tübingen in October 2013. In addition to teaching and research, he sits on the admission committee of Studienstiftung des deutschen Volkes and chairs a local group of scholars of that organisation. Professor Binder read Law in the University of Freiburg, and holds an LL.M. in banking and finance law from the London School of Economics and Political Science and a Ph.D. from the University of Freiburg.